A lovely place to stay. couple of minutes walk to the Handy for golf. 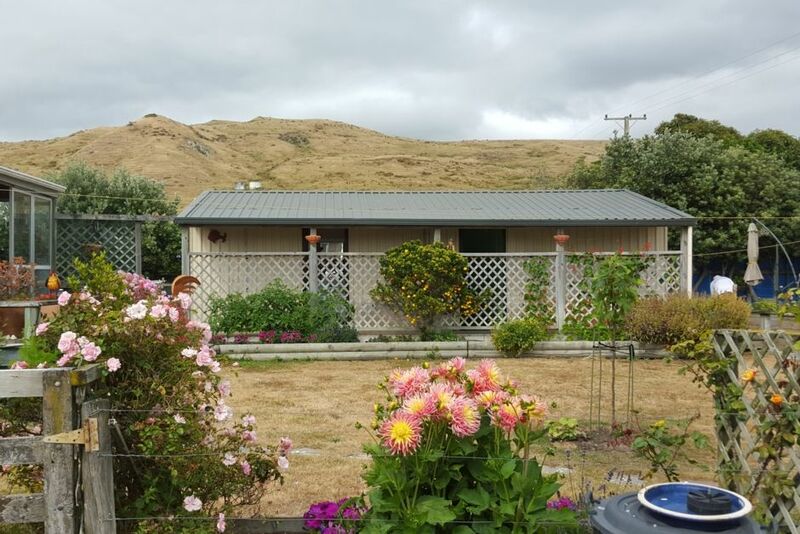 The accommodation is adjacent to the main house consisting of 2 bedrooms and a bathroom all connected by a outside covered walkway.The main bedroom (Queen Bed) contains Microwave, fridge, toaster, jug.,plus all cutlery,plates etc., Second bedroom has a double bed. there is NO INSIDE LOUNGE. Outside covered area with BBQ ,Sink ,hot and cold water, etc., and private patio area, ,and if you like to get away from it all and enjoy our beautiful scenery then this is the place for you. . Horse riding , fishing (a few minutes to river) ,tennis, visit the local marae, swimming , golfing. Historic homes in the surrounding areas cater for wonderful afternoon teas . Or if you prefer to sit back and relax in your private patio area you can do so.. This beach is a classic coastal beach. there will be times when you are they only person on the beach. Property backs on to Golf club . We loved Jillian's retreat, very cosy and comfortable, and accommodated all we needed. Jillian and Bruce were very hospitable, thank you so much. We will definitely be back sometime in the future. Clean and tidy. Had a lot of extra bits and pieces that were useful. Lovely hosts, very welcoming. We had nice weather during our stay, and this made using the outdoor kitchen, not a problem. Great little place. Spotlessly clean and comfortable and very hospitable owners. Loved our little cottage. Jillian and Bruce were very welcoming. The cottage is spotlessly clean and they have thought of everything that you might need from a mossie net and a fan to salt and pepper, and even oil for the BBQ. A great little summer spot and just a couple of minutes walk to the beautiful beach. Thank you for your great review. It was a pleasure to host you and we enjoyed the interesting conversation. Good luck for the future and if you ever travel this way we love to see you. Thanks you for your nice review. It was a pleasure hosting you. Welcome back anytime. Very nice clean & compact unit, with everything we needed made available. There's not a lot to do in Porangahau, so except for walks along the very long beach - so be prepared to relax completely. We loved the family of Tui's nested within a few metres of our door. A nice friendly couple, left the place spotless, we would welcome them back anytime.